Theres something for everyone at Grande Park. If you are a sports enthusiast, or just like to take a daily stroll, youll find just what you are looking for. Easily accessed from all neighborhoods with plenty of onsite parking, the Grande Park serves as the hub of our community. A place where friends and neighbors meet to play a friendly game of ball or a set of tennis, youll find plenty of activities. Wide, open spaces! Located in Plainfield, Grande Park's 885 acres encompass 17 neighborhoods and 300 acres of open space. The focal point is a 100-acre, centrally located park, appropriately named "Grande Park". It includes tennis courts, baseball/softball fields, numerous soccer fields of all sizes, basketball courts, a sledding hill, sand volleyball courts, picnic areas, shelter and playgrounds. We invite you to take a leisurely stroll along the neighborhood path, stop at the gazebo along tranquil Tiffany Lake to relax, or race to the playground for some fun! The ingredients for an enjoyable afternoon are all here at Whispering Woods Park. It includes approximately 14 acres of park, water and open space, playground picnic area, a sledding hill, bike trail, soccer field and gazebo. With a gently meandering trail leading to the park on the northern tip, Silverleaf Park has something for everyone. From a proposed basketball court and ballfield, to the playground and picnic shelter, you can have everything from a simple game of "horse" to an outdoor birthday party for 50 of your closest friends-without so much as a drop of juice spilling on your brand new carpet! Timber Wood Park includes 3 soccer fields, basketball court, playground, bike trail and baseball field. 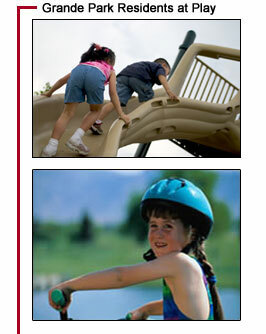 Ashgate Park includes 2 soccer fields, basketball court, playground, bike trail, baseball field and parking lot. Grande Park has a seven mile trail system for your daily workout. Walk, bike, run or roll; the choice is yours. We have plenty of convenient benches for those who might need a breather, want to chat with a friend or just find a place to enjoy nature. That’s what Grande Park is all about – your place to cultivate friendships, expand your horizons and spread your wings. Over 5 acres in size, Tiffany Lake is a beautiful setting for a casual wine and cheese picnic with a view. Our Glenmure custom home neighborhood and Roycroft East neighborhood by Kensington Homes offer homesites with wonderful views of Ashbee Park and Tiffany Lake-if you'd rather have your wine and cheese right on your patio. Hunter Lake - next to Huntercrest neighborhood. Over 6 acres in size, Grande Park Lake is one of the attractions of Grande Park.